As part of their effort to get make the T-Mobile and Sprint merger happen, T-Mo CEO John Legere and Sprint Executive Chairman Marcelo Claure today testified in front of the Senate Judiciary Committee’s antitrust panel. The panel included Senator Mike Lee [R-UT], Senator Amy Klobuchar [D-MN], and Senator Richard Blumenthal [D-CT]. Legere and Claure made 5G a focus of their arguments in favor of the merger. Both executives stressed how important it is for the U.S. to lead in 5G deployment, with Claure adding that the innovation could go to China if that country is able to gain a lead in 5G. George Slover, Senior Policy Counsel at Consumers Union, also testified in front of the Senate panel and suggested that T-Mobile and Sprint merging is just a shortcut and that the two carriers have already committed to building out 5G networks on their own. Slover went on to argue that it’s better for consumers if T-Mobile and Sprint build their own networks and compete. Claure countered by saying that Sprint lacks the resources to compete with AT&T and Verizon and that on its own, Sprint’s network would be limited to dense urban areas. Legere added that their combined 5G network will offer 3 times the capacity that separate networks would have. The change in the number of major U.S. carriers was another focus of this hearing. Legere argued that rather than shrinking from 4 carriers to 3, this merger would actually increase the number of major U.S. carriers from 2 to 3. Legere went on to say that combining T-Mobile and Sprint would lead to a more competitive company that would focus more on the enterprise market and that it could also get in the home broadband market to compete with AT&T, Charter, and Comcast. Gene Kimmelman, President and CEO of Public Knowledge and another person who testified today, said that we’re more likely to see better innovation and prices with four carriers. Kimmelman went on to say that historically, particularly in wireless, a concentration of competition would “leave prices higher than what a competitive marketplace would bear.” Concerns about the prepaid market were raised, too, with Slover saying that T-Mobile and Sprint’s prepaid efforts offer the best prices for consumers in that market. Jobs were another major focus of this hearing. When pressed on the matter of jobs by Senator Blumenthal, Legere said that the combined T-Mobile-Sprint would likely eliminate 3200 full-time jobs and another 8,000 retail jobs, adding that some urban jobs will be lost but rural jobs will be gained. 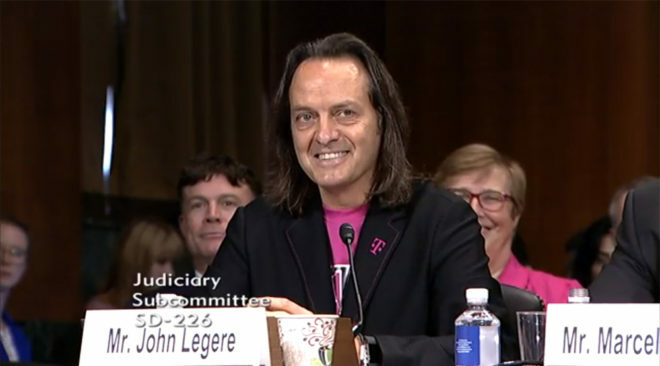 Legere claimed that the combined company “will be job positive by day one” thanks to efforts by creating more than 10,000 jobs in new businesses like home broadband. Also testifying in front of the Senate subcommittee was Ms. Asha Keddy, VP of Technology, Systems Architecture, and Client Group at Intel. Keddy touched a bit on 5G, saying that low, mid, and high band spectrum are all necessary to reap the full benefits of 5G. The merger of T-Mobile and Sprint is subject to regulatory approval and will be examined by the FCC and U.S. Department of Justice. In the mean time, you can watch today’s full hearing at the link below. It’s funny to see two guys who previously we beffing all the time working now working together to be on the same team. I hope this merger works for the better and doesn’t drag t-mobile down too. Just gotta trust that John wouldn’t let that happen. I don’t care HOW they word it, there will be more job cuts than creation. I disagree. There will be store expansion into rural areas. Jobs lost in the urban areas will be replaced in rural areas. That said, marginal store reps should be very worried. I agree with your point of rural jobs but disagree they will offset the ones lost in urban areas by so much that it moves into positive job growth. But I can agree to disagree as we will have to wait and see. I’m still on the fence for the merger. I actually have to agree with Legere’s assessment. AT&T and Verizon don’t really take T-Mobile and Sprint seriously. With the combined company they’ll have no choice. Still, it’s almost inevitable regardless of rhetoric that prices will increase. If they didn’t take them seriously I’m sure we would still have limited data plans. Data caps in the 20GB range are not taking them seriously. Also, let’s not forget that it was Sprint going to an unlimited plan that forced T-Mobile to adapt and offer ONE and the other 2 followed. Depriororitizaton is not a data cap it is a slow down only while in a congested area. Once out of the area you go back to full speeds so I’m not sure what you mean. The Uncarrier has become less consumer friendly lately. This trend will only worsen with the Sprint merger. That’s true and the trend will become catastrophic for consumers when Sprint can’t keep on their $32 billion debt load AND deploy 5G technology. Time to switch carriers I guess. There is a reason people are with T-Mobile. I know why I switched over to them. I didn’t want to have anything to do with Verizon or AT&T any longer. They charge ridiculous prices and offer horrible customer service. It’s not because they offer a better service, but because they have brand name recognition. This merger will also mean less jobs and less competition. I hope this merger doesn’t go through. Bigger is not better. I have already experienced this being a DirecTV, Verizon, AT&T and SBC customer. Sprint is dead anyway. If they do not merge T-Mobile will be significantly smaller than AT&T and Verizon. Sprint’s customers will move to all 3 carriers. If they merge at least then T-Mobile has fighting chance to take on the duopoly. If Sprint is really that bad off then let them go under. Sprint is _NOT_ a bank last time I checked, so too-big-to-fail need not apply. If the FTC and FCC handle it right the assets can be sold off in a way that ensures a 4th carrier can emerge from the ashes. There are plenty of other players that would like to get into the wireless game, Dish comes to Mind. The only ones that will really benefit from the merger are Sprint’s creditors and T-Mobile execs. Customers will get shafted either way. I think that is wishful thinking. There are plenty of companies that would like to acquire spectrum (true) but not exactly many that are interested in entering the wireless industry in the form of a 4th wireless carrier. In all reality, the spectrum will likely be acquired and remain unused or be acquired in a company soon to be gobbled up by another company like AT&T or Verizon. Dish will likely not be around for another 10 years without a drastic change in strategy which leads me to believe they will be open to being acquired – very similar to DirecTV. If the price is right, a company is for sale. At least if we put a company in the hands of a stable company with good intentions, this would be less of a concern. Wishful, you bet. But if you remember when ATT wanted to grab T-Mobile they were playing it as T-Mobile couldn’t survive… Obviously the breakup fee helped but now look where we are. The greed aspect is why I see having 4 carriers as the bigger priority. Only way the deal is the better route is if the regulators are so glaringly devoid of ethics that Sprint going under would ultimately lead to three carriers. That’s about the only case where I’m remotely for the Sprint deal passing, better Magenta gets most of the spectrum than Blue or Red. and AT&T’s arguments were correct then. T-Mobile wouldn’t have survived if it weren’t for the change in direction thanks to John Legere and eventually (after several years) T-Mobile won the backing (and later investments) of its parent company. It’s kinda apples to oranges. But I do agree, T-Mobile should be allowed to keep most of the spectrum but some should be sold to Verizon and AT&T to help them compete and hopefully the good competition continue. I will say in the long term, it won’t matter as other players enter the game and seek to use other technologies to operate their networks. I believe we should see services rolled out by Comcast and Spectrum in the near future (most likely 2019 – 2020). The company remains T-Mobile. Think of it as the T-Mobile you know with tons of new Sprint spectrum. Oh? Which carrier are you gonna switch to? Got any ideas? Who knows maybe it won’t happen and maybe it won’be be as bad as the other 4 mergers that I have gone through. I will wait to see how things go. In the meantime I will do research. But I do not want to go back to either AT&T or Verizon. I keep ending up with them because of mergers and/or buyouts. They are sorely lacking. I’m just hoping a bigger T-Mobile doesn’t make them like the two big conglomerates. Umm, as consukers, and as cirrcur T-Mobile customers, what we should be exxitdd about is the gargantunt amount of spectrum the combined company will have!!! I seriously doubt they’ll be able to keep it all. If it goes through and the regulators aren’t completely ethically bankrupt T-Mobile will be forced to sell off spectrum in markets where they obviously have too much. In part to maintain competition and open the doors for a new carrier to emerge. Get ready for Higher prices !!! At&t ,Verizon and T-Mobile wont compete in prices anymore. The new customers will be the 1st victims and then the rest. I 100% support this because it will make T-Mobile better. If my bill were to even go up $10 to $20 I would be fine with it if it brings faster speeds, better coverage and my plan with unlimited data does not change. T-Mobile is so cheap already compared to everyone else. Even with a 10 to $20 change, they will still be cheaper. Its the extras that you get with the cost. Also T-Mobiles $70 is $70 no extra fees or crap and those add up with family plans. Which is why I would be willing to pay 10 or $20 more for what ATT gives but where I live and everywhere I drive, I have T-Mobile and there is no reason to pay more for nothing. It would be nice to have better service if I go somewhere where no one lives but that doesn’t happen often enough to pay for it. Pretty disgusting to watch how Marcelo Claure to snap his own face. Few months back he told everyone that Sprint had the BEST network in US(plus most investment) and would be No. 1 for 5G network since Sprint had most advantage and money(if you believed it…)…. Now he almost cried to tell the committee that Sprint has the worst network and worst financial debt which even couldn’t survive, and there is no way to do any investment for 5G. Come on…..
T-Mobile is no longer cheap, Sprint is virtually dead already, so the merge might not change much anyway. It is compared to what you get with AT&T or Verizon. They are so expensive. T-Mobile is actually still pretty cheap if you compare apples to apples. If you are comparing apples to oranges, you might find that T-Mobile is expensive. Also, don’t forget about T-Mobile’s own MetroPC’s that would directly benefit from this. The prepaid arm of T-Mobile would see immediate benefits. Prepaid carriers would normally be intentionally neglected by their parent companies. For example, AT&T’s Cricket does not truly offer 4G/LTE speeds, despite using the technology the speeds are capped. This also applies to a lot of the MNVO’s which prevents customers from accessing fast speeds on a prepaid plan. T-Mobile is hoping to compete toe to toe with AT&T in the future by being able to offer all 4 services. Right now, there is no disrupting force in cable, internet and home phone arena. Remember, T-Mobile vowed to take aim at those industries next? This prevents the likes of AT&T, Verizon, Comcast and Spectrum from continuing to dominate and set the standards on the industry the way AT&T and Verizon did in the wireless industries. t mobile is buying sprint for $26 billion but sprint debt is 37 billion. now youi know why sprint wants this merger.